Thinking about sales - Just Listen! Thinking about sales – Just Listen! This is a Sales Best Practices article from guest poster Dave Kahle, author and leading sales educator. Follow Dave’s latest Tweets at @davekahle. I recently came across some research that confirmed what many of us in the profession of educating sales people have known for years: That purchasers would be “much more likely” to buy from a sales person if that sales person would just “listen” to the customer. (1) The survey found that some of the worst offenders were experienced sales people. Listening is one of the four fundamental competencies of a professional sales person, and yet, the profession is, in general, so poor at it that most customers remark on our inability to do it well. Wow! If there is anyone I wouldn’t want thinking I was a poor listener, my customers would be towards the top of the list. Why is listening such a powerful sales competency? In my book Question Your Way to Sales Success, I describe a number of reasons. Here are a few. First, it is our primary way of digging beneath the surface of a customer’s needs and uncovering deeper and more powerful needs and motivations. That makes it a primary tool – of which the skillful use separates the master sales people from the mediocre. For example, it doesn’t take any skill whatsoever to pick up an RFQ, a set of blueprints, or to write down a list of what the customer says he needs. You don’t have to be a master listener to do that. But to dig deeper and uncover deeper issues, that takes the ability to listen. Lots of sales people would look up the price and provide it. There. Job done. The master would hear the words “Thinking of going…” and dig a little deeper. “What makes you interested in that?” he says. I don’t have to take this scenario much further to make the point. A visit with the production supervisor could very well result in a deeper understanding of the problem and the development of an alternative solution with a whole lot more gross margin to it. The master sales person, exercising excellent listening skills, hears opportunities where many sales people don’t. Listening is the primary tool for digging deeper and uncovering deeper and more significant issues in our customers. But that’s not all. When we listen, we send a powerful message that we care about the other person. Conversely, when we don’t listen, we send the message that our agenda is far more important than the customer’s trivial ideas and issues. That makes effective listening one of the all time great relationship-building devices. Listening requires us to take in information, ideas and opinions that are outside our comforts zones. It is, therefore, one of the primary tools we use to grow intellectually, to broaden our views, and ultimately, to become wiser and more knowledgeable. If we never listen to someone with a different perspective, we never consider the possibility that we might be wrong. From a sales person’s perspective, the more we listen, the more different positions, motivations, opinions and nuances we are able to understand and accommodate. The wiser and more capable we become. Since we are able to understand an ever-growing panoply of positions and opinions, we are able to feel a rapport with more and more customers, and move closer to a consensus position with them. Listening positions us as a consultant, not a peddler, in the eyes of the customer. Ultimately, listening provides us our competitive edge. Here are two specific techniques to help you improve your listening effectiveness. My wife is a crisis counselor. She talks about “listening empathetically.” That means she listens in order to understand what a person is feeling. That is very appropriate for that type of work. However, we are sales people. It is more important that we listen “constructively.” Think of “constructively – construction – building.” We need to listen for things upon which to build. Listen for opportunities, problems, opinions, etc. on which we can build our solutions. By planting those questions into your mind, you sharpen your sensitivity to what the customer says, enabling you to listen more constructively to the customer’s conversation. Discipline yourself to build the habit of responding to your customer’s comments. Here’s how we think the sales interview should go. We respond to the answer. We now ask another question. Notice that we have intervened in the process with something we call a “response.” A response is a verbal or non-verbal signal that we send to the customer that we are listening, and accepting what the customer says. It flatters the customer, makes him/her feel good about answering, and encourages him/her to answer in more depth and detail. 1. Select one or two words out of the customer’s conversation, and repeat them back to the customer, nodding your head. The customer responds by talking for a few moments about his challenges. When he pauses, you say, “back orders” and nod your head. “Back orders” was one of the issues he talked about. You just repeated it, and nodded your head. That’s a powerful response because it shows the customer that you have listened to the point that you have captured and repeated one of his main thoughts. That feels good to the customer and conditions him to answer the next question with even more depth and detail. Just as importantly, since you were focused on finding a key word or two to repeat, you had to listen to the customer’s conversation! This technique forced you to listen more effectively, and made the customer feel good in the process. 2. Summarize and rephrase what the customer has said, and repeat it back to him. This is similar to the one or two word techniques discussed above, more intense. When the customer has finished answering your question, you say something like this: “Let me see if I understand you correctly. In other words, what you are saying is…………………………” Paraphrase and give him back your understanding of what he just said. Like the prior technique, this is a powerful tool because it forces you to listen, it engages the customer, and it seeks agreement. Using this a couple of times in the sales interview will make the customer feel good about you, ensure that you understand him, and create an atmosphere of agreement. Ultimately, your ability to listen more effectively evolves out of your discipline to apply some of these techniques regularly and methodically. If you are going to listen more effectively, you must first make the commitment to expend the effort to do so. 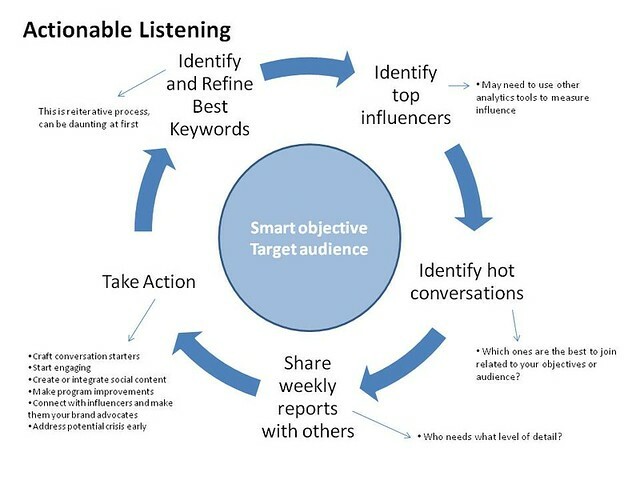 Image “Actionable Listening” by Cambodia4kids.org Beth Kanter on Flickr under Creative Commons license. Dave Kahle is one of the world’s leading sales educators. He’s written nine books, presented in 47 states and eight countries, and has helped enrich tens of thousands of sales people and transform hundreds of sales organizations. Sign up for his free weekly Ezine. A great source of specific tools to help you close is Dave’s book, Question Your Way to Sales Success.